It's easy to print crisp and clear documents and images with the HP 428 printer. Eventually your HP 428 will use all of your printer ink, and when it finally happens you'll soon learn that new HP 428 ink is generally pricey. Fortunately you do not need to be anxious about coughing up the high purchase prices you'll get on the high street because here at Cartridge Save you can purchase all the HP 428 cartridges you will need at low cost. Save more cash on your ink by purchasing online at Cartridge Save! You don't need to fork over for the 428 original cartridge or 428 compatible ink down the high street when you can quickly save a handful of money buying online with Cartridge Save. You have full peace of mind when ordering PhotoSmart 428 ink cartridges from us seeing as every one is covered by a cast iron money back guarantee. Be mindful of the fact that every single purchase comes with free delivery, typically arriving with you on the following day! Often described as one of the most innovative models from the Photosmart series because of its sleek and compact design, PictBridge capabilities, and lab-quality output, the HP Photosmart 428 is popular with photography enthusiasts. However, there are limits to what the 428 can do because it seems to only be compatible with select HP cameras. Photos also smudge easily when exposed to moisture. HP integrated a proprietary camera dock for compatible devices on the body of the HP Photosmart 428. That way, the printer can simultaneously charge the batteries of the camera and print. All controls are conveniently located on top of the printer body and are intuitively laid out. The HP Photosmart 428 features 2 USB 2.0 slots. Users can connect the HP Photosmart 428 to a TV to view pictures or use the HP digital camera which is bundled with the printer. This device is highly portable and lightweight, which is why it is often described as a photo studio on-the-go. The HP Photosmart 428 can also print from PictBridge-compatible cameras and computers via USB 2.0. It is user-friendly and features easy-to-understand controls. 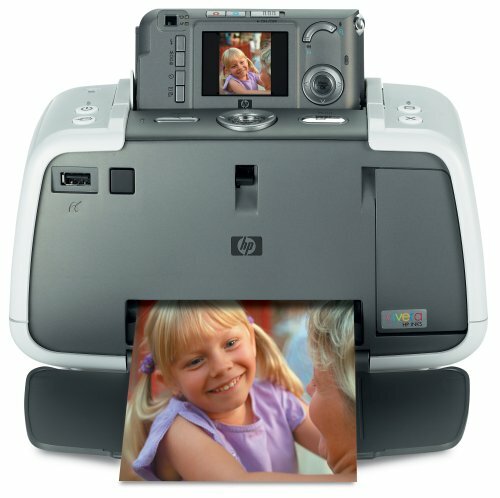 There is no actual LCD screen on the printer; users need to view the pictures on their computer, connect the printer to a TV, or sift through the images from a compatible HP digital camera while it is docked on the printer. The print quality is inferior to standalone photo printers by the same manufacturer because of over-saturation and the quality of the ink. Finally, like other Photosmart printers, the HP Photosmart 428 can only print on standard-sized photo paper (4x6-inch and 13x17-inch). The camera that comes with it is an ordinary point-and-shoot – certainly not good enough for serious digital photography enthusiasts.